Upon arrival at Trivandrum airport, you will be meeting our representative followed by a drive to Kovalam. On arrival at Kovalam, you can check-in at a selected hotel. Later, you will visit the beautiful golden beaches of Kovalam like Lighthouse Beach, Howah Beach and Ashoka Beach. Overnight stay at the hotel in Kovalam. After breakfast at the hotel, you will proceed for an excursion to Trivandrum, where you can sight-see attractions like Sree Padmanabha Swami Temple, Kuthiramalika Palace Museum, The Napier Museum, Sree Chithra Art Gallery, Zoological Park, Science & Technology Museum, Kanakakunnu Palace, and Planetarium. 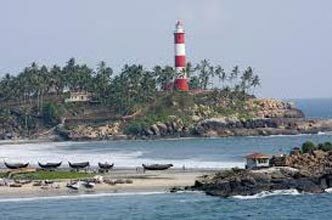 After Trivandrum sightseeing tour, you will return to Kovalam for an overnight stay in the hotel. After breakfast at the hotel, you can spend a day free for self-activities followed by an overnight stay at the hotel in Kovalam. After breakfast at the hotel, you will be driven to Alleppey. Enjoy the magic of backwater by going on a Houseboat (Kettuvallam) cruise across the backwaters. Spend the next 22 hours in your floating villa. 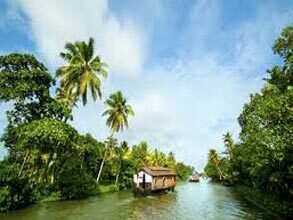 Enjoy the backwaters of Kerala by getting a glimpse of the village life at close quarters; a unique and unforgettable experience. Enjoy the sunset and stay overnight at the houseboat with breakfast, lunch, and dinner all included. After breakfast drive to Thekkady. On arrival at Thekkady, check in at the hotel. After some rest, you can go for a game viewing cruise on the Periyar Lake. Here you will be able to see a large variety of wildlife, which includes elephants, monkeys, deer, wild boar etc, and quite a lot of unique birds can also be spotted. Later, come back to the hotel; relax and enjoy your overnight stay. After breakfast at the hotel, you will be driven to Munnar. 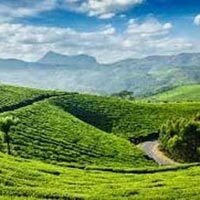 Enjoy the stunning panoramic view of the hills and green carpets of tea plantations en routing to Munnar. On arrival at Munnar, you can check-in at the hotel. Spend rest of the day at ease followed by an overnight stay at Munnar. 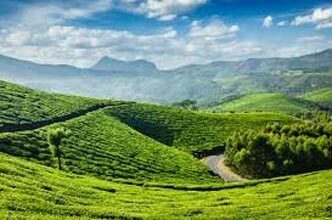 After breakfast, spend a full day sightseeing in and around Munnar. Enjoy panoramic views of Anamudi, the highest peak of South India at 2695 m, which is visible from Munnar. Visit the Christ Church and proceed for wildlife watching at Eravikulam National Park (16 km). Continue your tour to Rajamalai Hills lying adjacent to the park and stop by at the Madupetty Dam, a famous picnic spot for boating and horse riding. In the evening you can transfer to the hotel, followed by an overnight stay at the hotel in Munnar. After breakfast at the hotel, you can visit the tea estate and spice plantation. Later in the noon, spend the rest of the day with self-activities, followed by an overnight stay at the hotel. After breakfast at the hotel, you will be driven to Cochin. On arrival at Cochin International Airport, you will be dropped to connect flights for your onward destination. Destinations Covered : Kochi, Kollam, Kovalam, Alleppey, Trivan..